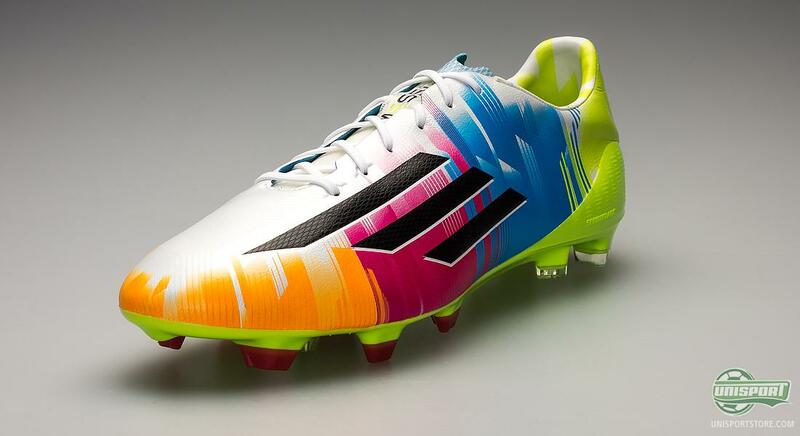 Adidas have today launched Lionel Messi’s latest signature colour of the Adidas F50 Adizero that is very much inspired by the samba rhythms, which we will experience in Brazil this summer. It is without a doubt the most colourful boot from Adidas to date. We take a closer look at it here. 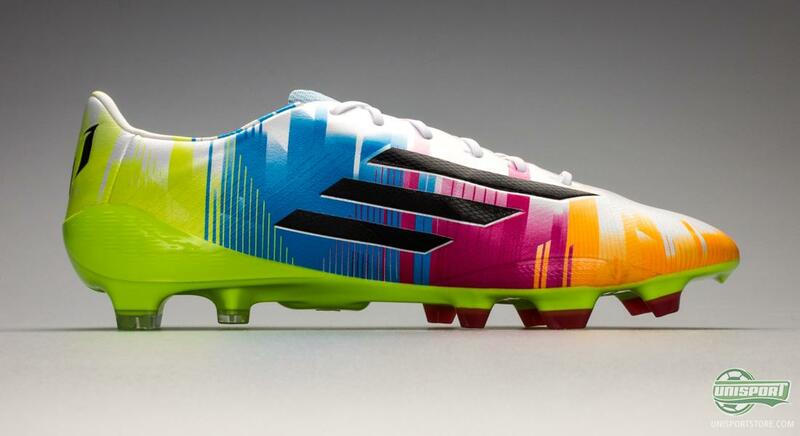 Lionel Messi has no limits on the football pitch and judging by his recent boot design, he can even walk on rainbows… Alright, alright, maybe not, but his new boot certainly has some spice and fresh colours. It is inspired by Adidas’ recent Samba Pack, but it is not just any Adizero, as it has been made especially for the Argentinian wizard. 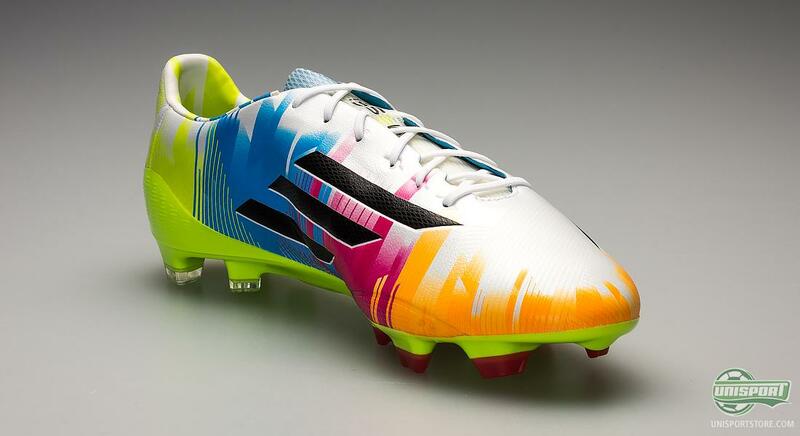 It truly is an explosion of colours on Leo Messi’s new Adizero football boots, where Adidas have been inspired by the Samba Pack. 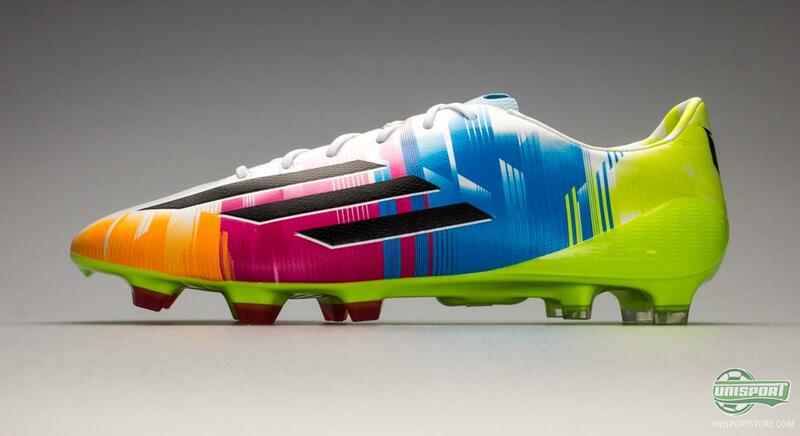 The colours are lime (Nitrocharge), blue and orange (Adizero), as well as Pink (Predator LZ). These colours combined make for a very special boot, for a very special player. Do you love the new Adidas F50 Adizero Messi? Pre-order your own pair right here – just €218. 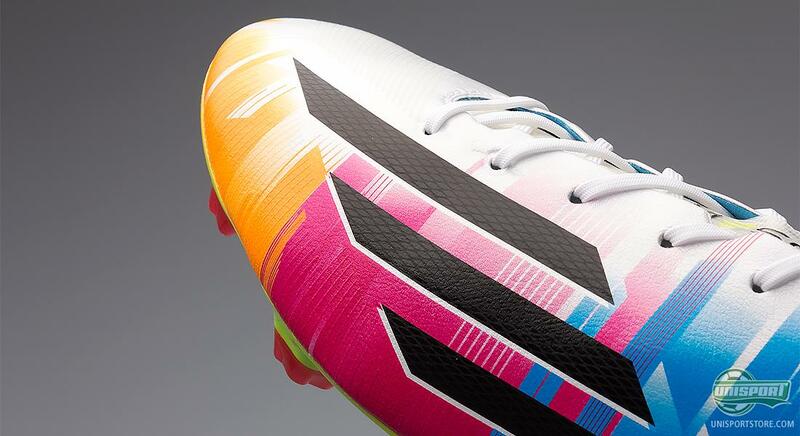 The four colours make for a very unique design, which we have never seen the likes of before – and it does look like Adidas have taken a completely white Adizero and run a paint brush down the side, with all the colours from the Samba Pack. The white colour symbolises the pure elegance of Messi’s play, while the many colours represent the many nuances in the Argentines play. 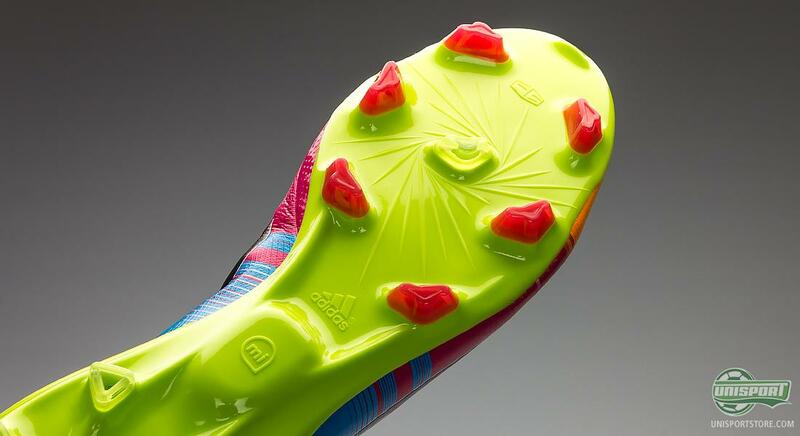 It is, however, not just the design of Messi’s new Adizero that is unique; the football boot is also made with an upper, of Hybridtouch and is therefore made without Speedfoil on the heel. Hybridtouch is Adidas’ kangaroo leather emulating synthetic – and with Messi being known for his love of leather, this was a perfect choice of material. On the other hand they have found room on the boot tongue, for the Speedfoil material and a soft suede edge, to keep the weight low. The upper on Messi’s F50 Adizero is still equipped with Dribbletex, which is a row of sticky stripes that ensure an improved grip, so you never lose the ball when traveling at top speed. 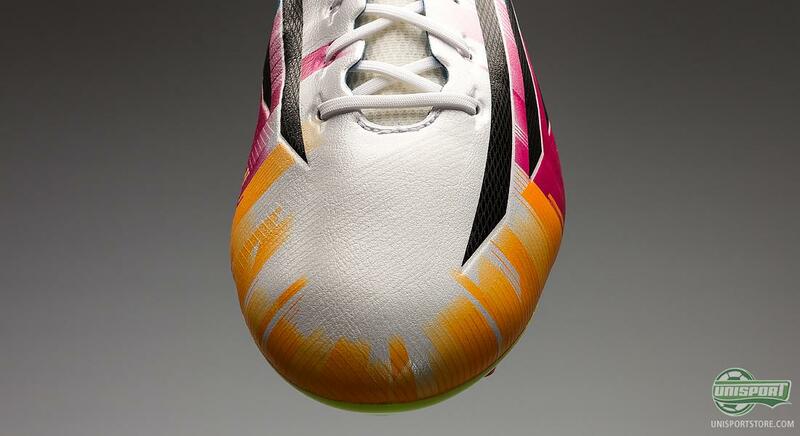 Once again they have made the Messi F50 unique, with the Messi boot being entirely covered by these stripes, rather than just the nose, as it is on the regular F50 Adizero. One of the Adizero’s biggest forces is the low weight and this is still a part of the Messi F50. 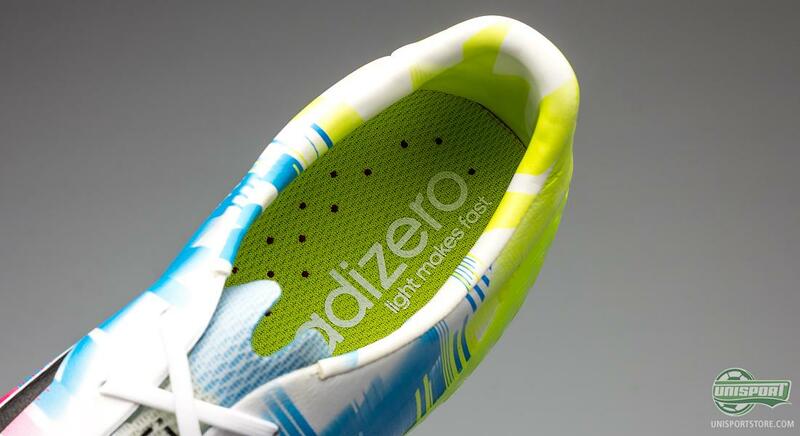 You would think Adidas’ decision to use the Hybridtouch material, rather than their incredibly light Speedfoil material, would cost the boot in the weight department. This is however not the case, with boot weighing just 6 grams more, which puts it at 156 grams. We certainly approve. 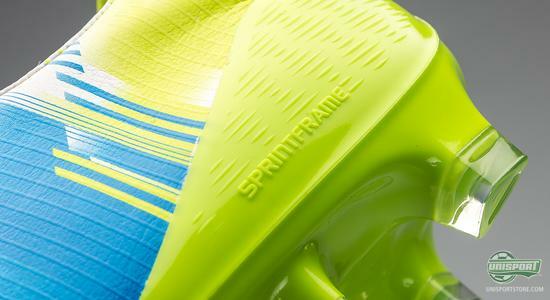 With the sole and stud-configuration everything is the same and Adidas’ new Speedtraxion, which was introduced on the newest generation of the Adizero. It has been optimised to give a grip, which is 14% better, than on the old Traxion 2.0 stud-configuration. At the same time the studs glide through the ground 3% easier, when you turn on the spot. This all comes from extensive research from Adidas, who have worked hard to make a boot, which is perfect for a fast player, who can turn on the spot. 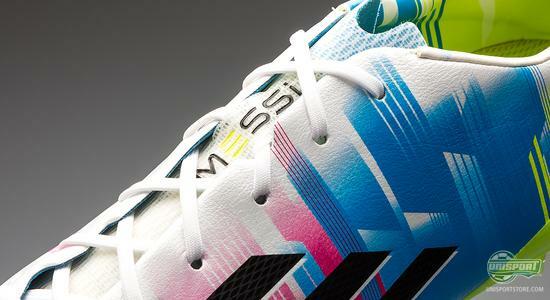 Lionel Messi will – of course – be the only Adidas player, who will wear the new signature boot of the Adidas F50 Adizero and he will wear it on the pitch, when FC Barcelona host Manchester City on Tuesday. 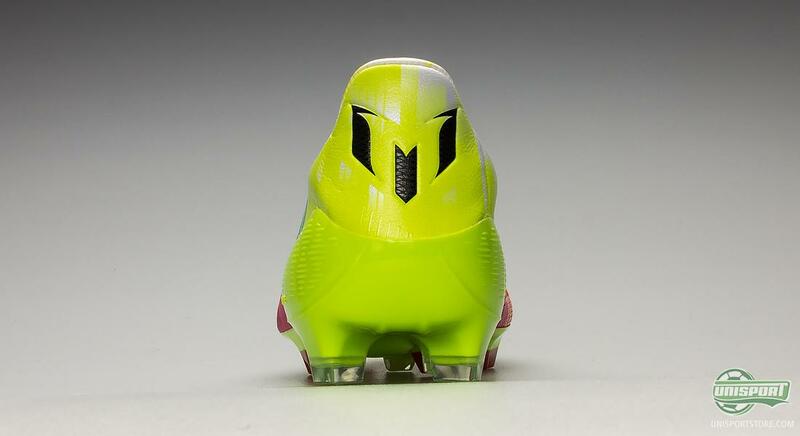 To show that this is in fact Messi’s very own boot, Adidas have removed their logo on the heel and replaced it with the Messi logo. Whether or not Messi’s feet will be extra samba inspired, when they play Man City tomorrow, only time will tell, but we are looking forward to seeing them in action. 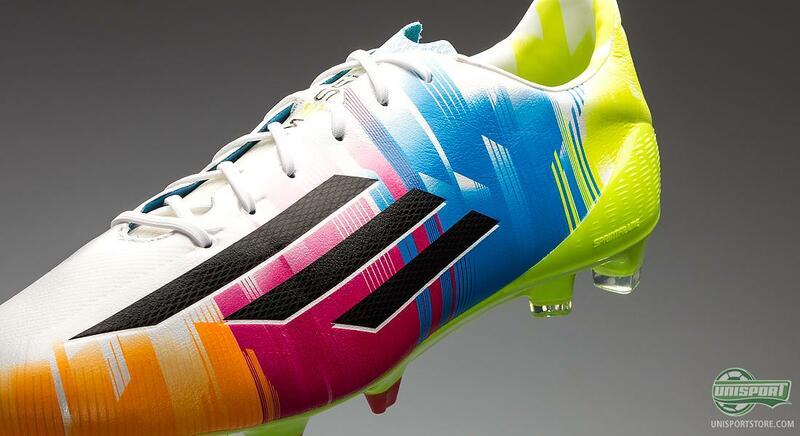 Lionel Messi’s new football boot is very colourful – but what do you think about Leo’s new Adidas F50 Adizero Messi? Are the many colours anything for you? Feel free to share your thoughts with us in the comment-section down below, or on Facebook and Twitter.